Richard Harris's blog at NPR has a good story about doctors' efforts to develop and use antiserum to treat Ebola. According to ABC news, Dr. Kent Brantly, who was seen at Emory University Hospital was treated with antiserum as was the other aid worker, Nancy Writebol. Antiserum is the liquid portion of blood that contains the antibody proteins. Antibodies are present in your blood all the time, but special cells, the B cells, produce more of them when your body is trying to fight off some kind of disease. The problem with antibody-mediated immunity is that it takes time for your body to make these proteins and even then, the proteins you make might not work very well. When immediate protection is needed, antiserum from an immune donorcan act much more quickly. That's why we use antiserum to treat cases of snake bite, hepatitis exposure, and to protect people from tetanus. And that's why it was important for stopping diphtheria and saving the children in Nome. I thought you might like to see a close up view of what these kinds of antibodies look like. This first image is from a structure I downloaded from the NCBI, 3CSY, and viewed in Molecule World. 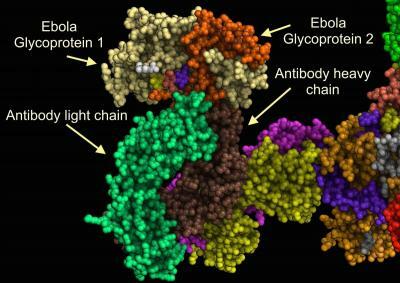 It shows a portion of an antibody, called the Fab fragment, bound to two of the glycoproteins from the outside of the Ebola virus. The antibodies were derived from someone who was infected with Ebola in the 1995 Kikwit outbreak and survived (1). Zooming in lets me see how tightly the antibody and the viral proteins fit together. We can see where the antibody binds to the viral protein, right near some of the sugar residues. 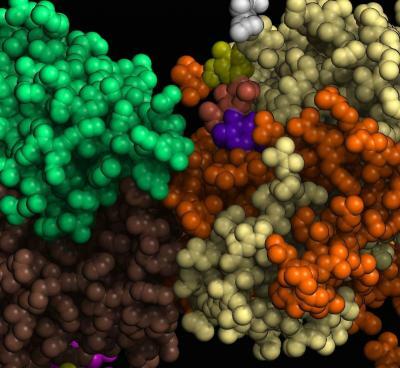 Knowing the amino acid sequence at the antibody binding site can help scientists engineer protective antibodies and produce them in E. coli or other other organisms. These kinds of treatments aren't perfect, but they can help Ebola victims. I made all the pictures from images saved in Molecule World. 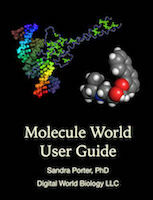 Visit the iTunes app store to download the Molecule World app and explore this structure on your phone or iPad.